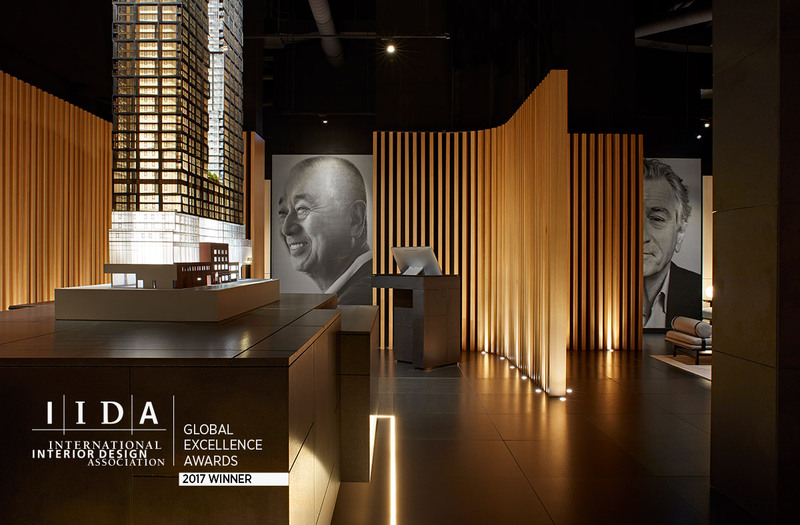 Nobu Residences Toronto, the highly anticipated high-rise anchoring Canada’s first Nobu Hotel and Nobu Restaurant was honoured with a prestigious International Interior Design Association Award for its remarkable presentation gallery. The IIDA Global Excellence Awards honour and celebrate outstanding originality and excellence in the creation of international Interior Design/ Interior Architecture projects from around the globe. The gallery is a design marvel – with the team electing to control the natural light in order to maintain the luxury brand’s exclusivity, and transporting visitors into a modern oasis representative of the Nobu lifestyle. The interplay between the ethereal living elements and the lack of natural light allows guests to absorb themselves in the tranquil atmosphere, evoking a desirable cadence for one’s residential life. Embodying the elements of a Japanese reflection pond, guests enter a long corridor enformed by a symmetrical water feature. The many delicate streams of water flow downwards from the ceiling, gathering in a curved pool which is integrated into the jet-black stone floor. 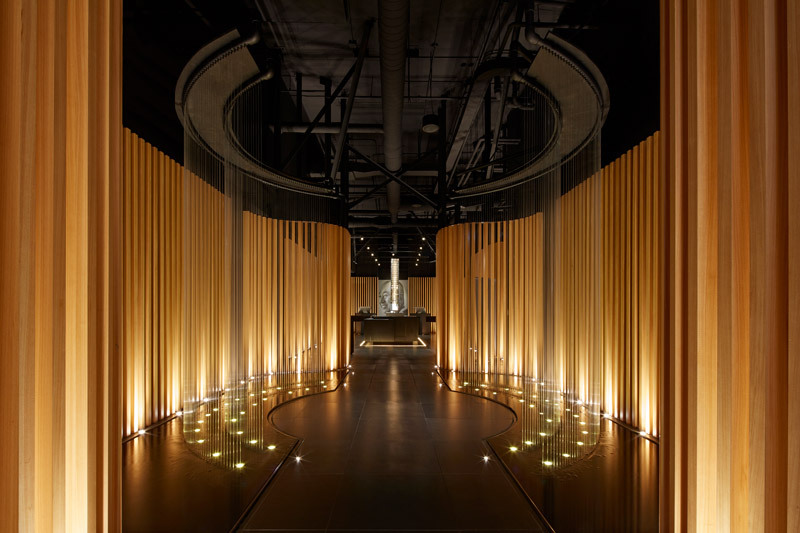 The rhythm of the water is a metronome of tranquility as guests emerge into the open space amongst interior walls shaped with blonde, vertical wood slats reminiscent of the Japanese wood, Hinoki. Absent of all natural light, the space transforms into an intimate succession of lounge seating illuminated by soft, ambient lighting. 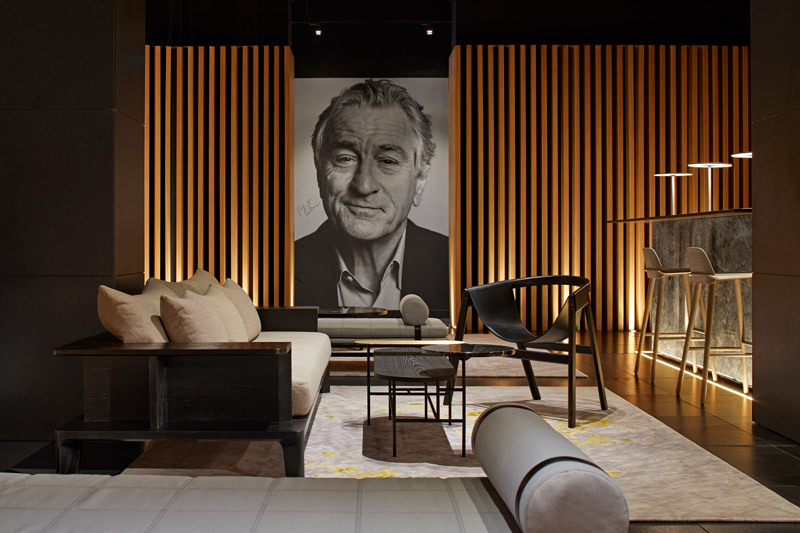 Oversized black and white portraits autographed by Chef Nobu Matsuhisa and Robert De Niro welcome guests into the model suite. 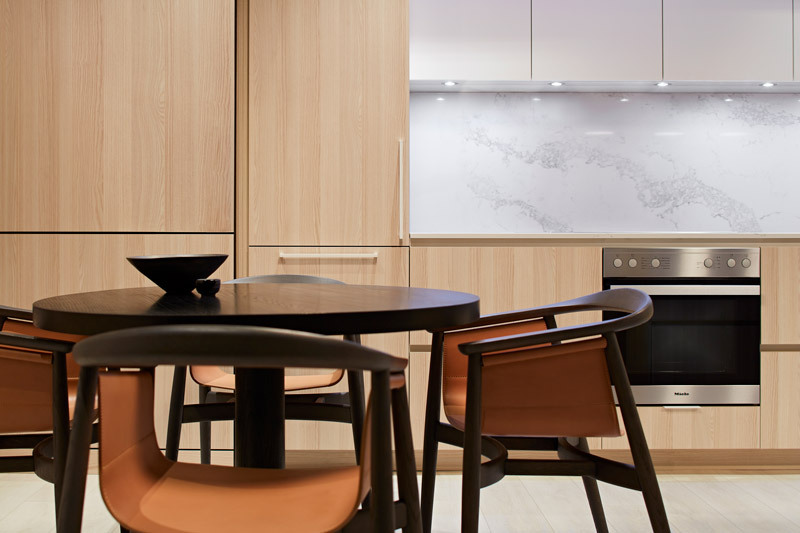 A model kitchen and living room invite guests to experience the brand’s offerings through elegant marble surfaces and refined modern furnishings while suspending the hustle and bustle of the cosmopolitan downtown experience outside the presentation gallery’s boundaries.